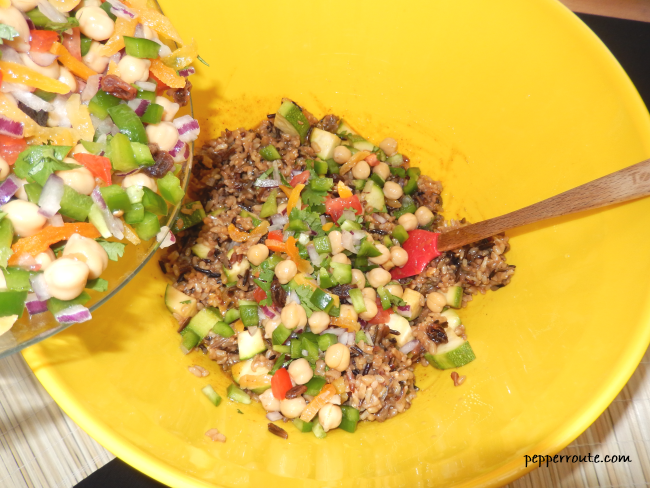 A salad that is full of flavor and a combination of healthy ingredients… at the same time filling enough that you won’t be looking for something to eat in 45 minutes! 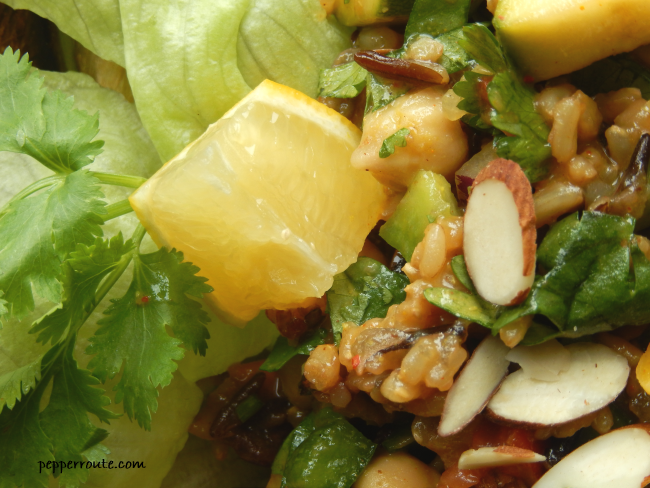 That is what this Moroccan wild rice salad is! Starting with a base of varieties wild rice, it goes on to build up the goodness with garbanzo beans, vegetables, dry fruits and nuts. A generous dressing that combines multiple flavors completes the dish to end up with a complex flavourful, and satisfying meal in itself! I had bought this bag of wild rice mix, consisting of red, black and brown rices. 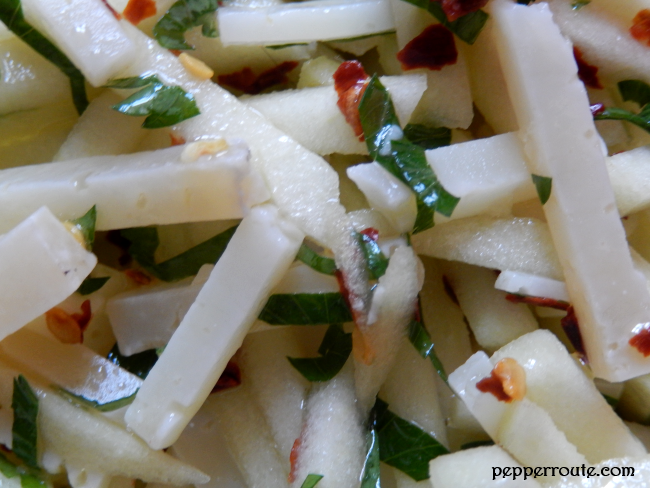 Since then, it has become a sort of go-to ingredient to me for adding heft to simple salads. 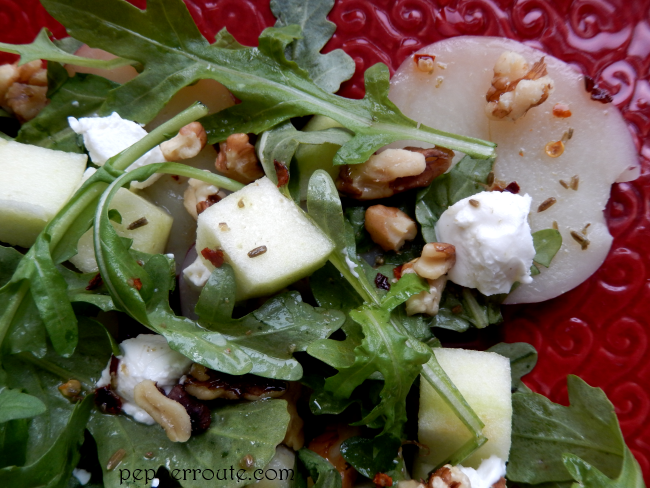 This salad started the same way, but turned into something that was much more interesting than a simple salad. 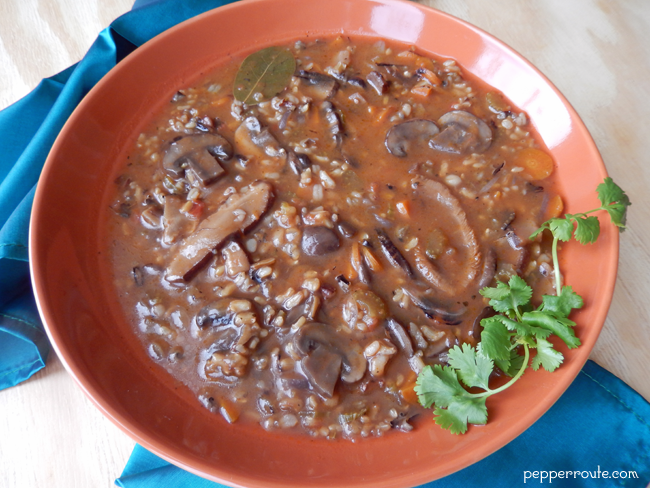 A rice and beans combination is always a good base to start. And again, I went with my go-to beans variety… the garbanzo beans. For vegetables, I chose what came in handy – zucchini, peppers, tomato and red onion. Unfortunately, I only had green peppers in the refrigerator, but am sure the use of multi-hued peppers would have looked better. Dried apricots and raisins add a touch of sweetness to the mix. This theme of tartness and sweetness is repeated in the dressing too… with rice vinegar, lemon juice, and honey. And soy sauce to flavor the base. However, the dry spices used in the dressing are the key to the smoky, zesty flavour of the whole dish, along with a bunch of cilantro leaves that add a tangy freshness. 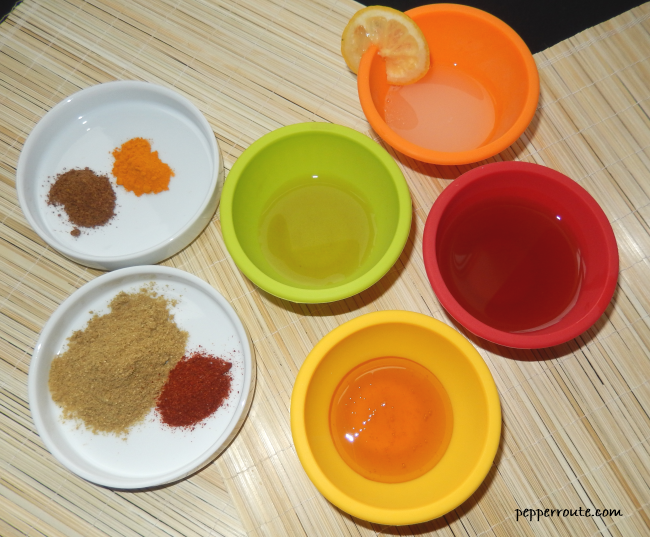 These spice powders are dry roasted to bring out their fragrance. 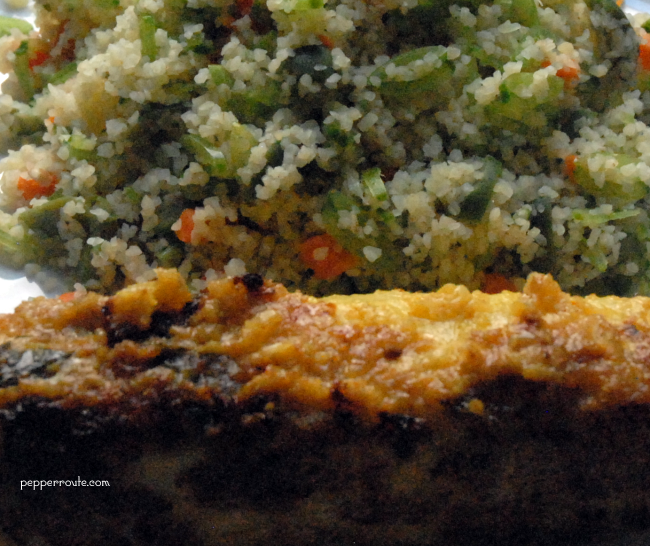 Though the dish has a longish ingredient list, the process is quite simple. 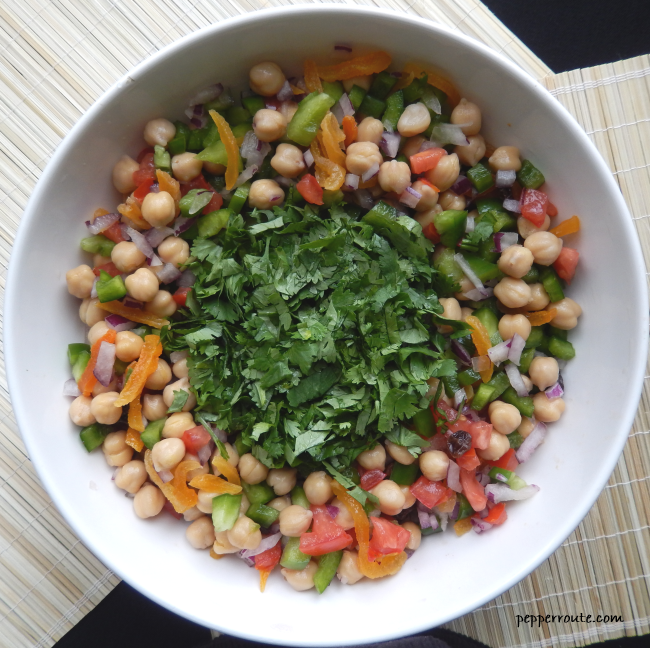 Mix all the chopped up vegetables and dried fruits with cilantro and the beans. Cook the rice with the soy sauce. 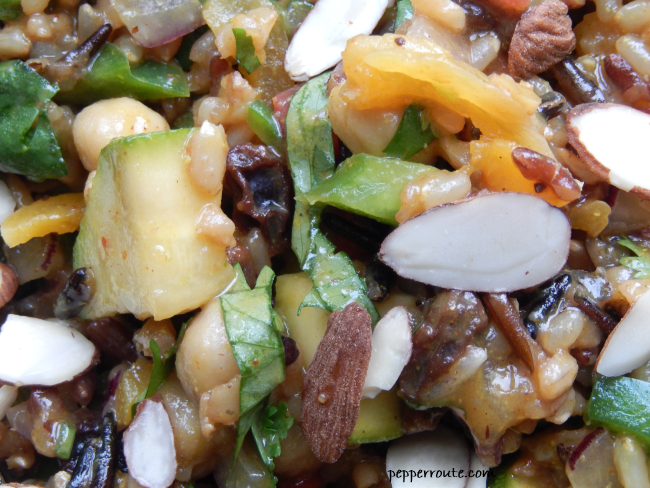 Add the rice and vegetable-beans mixture to the dressing. Garnish with almond slices, and the salad is ready to go! Looks pretty when served on a bed of lettuce leaves with wedges of lemon. This keeps very well in the refrigerator for up to 24 hours. Only, remember to bring it to room temperature before serving. 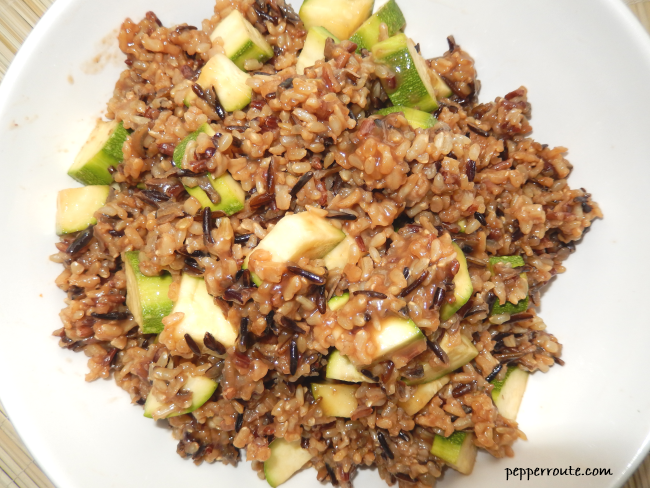 Cook the wild rice, according to package instructions, along with the soy sauce and salt to taste. When the rice is cooked, turn off the heat and place the zucchini pieces on top of the rice. Cover the pan and let it rest for 10 minutes. Thinly slice the red onion, pepper and tomato. 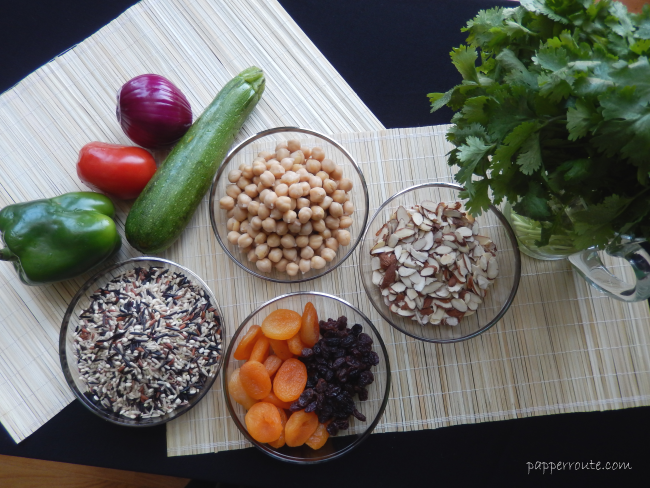 Mix together the vegetables, garbanzo beans, sliced apricots, raisins, and chopped cilantro. Set a frying pan on low heat and dry roast the coriander powder for 1 minute. Add the turmeric powder and continue roasting for another minute. 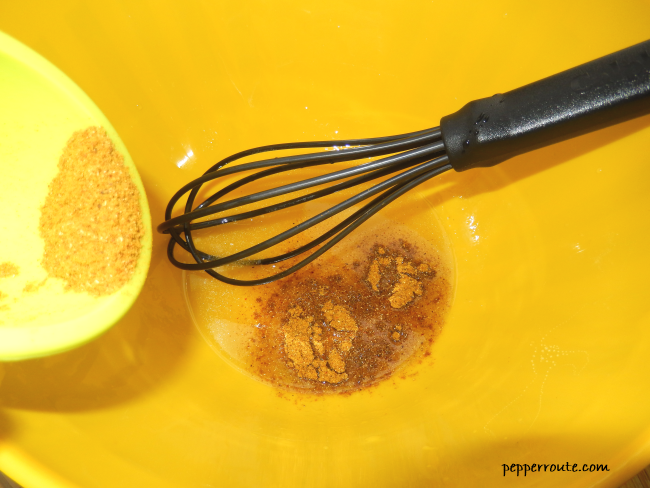 Add the curry powder and chili powder and remove from the heat and keep stirring till cool. In a large bowl, mix the rice vinegar, lemon juice and honey. 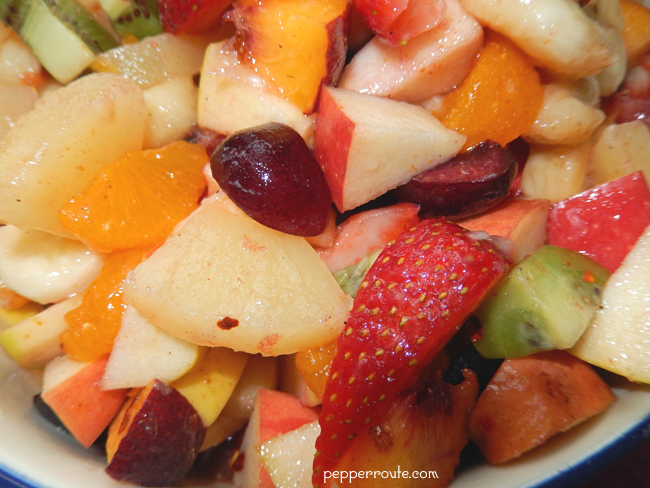 Add the roasted powders and mix well to make the dressing. Add the cooked rice to the dressing. Mix well. Add the vegetables-beans-fruits-cilantro combination and mix well. 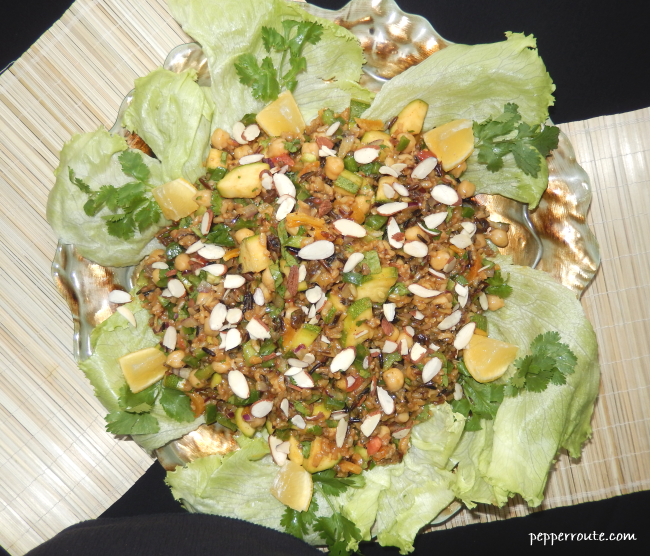 Serve on a bed of lettuce leaves, garnished with almond sliced and lemon wedges.